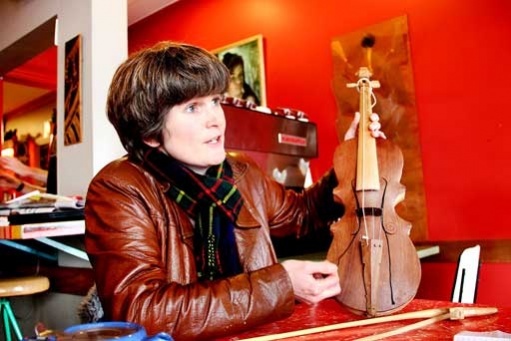 Sumatran Sounds is the website for Dr Megan Collins. Contemporary Musicologist and practice based researcher, Megan is a music theorist, composer and radio documentary maker from Wellington, New Zealand. Born and raised on the eastern coast of New Zealand, Megan was educated at Victoria University, Wellington and Institute Seni Indonesia (ISI) the Tertiary Arts Institute in West Sumatra, Indonesia. She speaks English and Indonesian and works predominantly in the domains of ethnomusicology, radio and cross-cultural composition. Megan performs regularly in New Zealand and Indonesia. Her current academic interests include hybridity in music, individual agency in culture and performing ethnography. This year’s Night Hub concert at Vic Uni Wellington will showcase Indonesian music and dance in New Zealand. Featuring guest dancers from Indonesia accompanied by Gamelan Padhang Moncar and Gamelan Taniwha Jaya. A beautiful kolaborasi with the touring group, Orokaya – The Rythm of Sunda who come from Bandung in Indonesia. What a privilege to perform rabab Pasisia Minangkabau with Pak Fariz who played the bowed tarawangsa from Sunda. Terimakasih! Up to the Auckland Indonesian Festival with Gamelan Wellington and Budi Putra to perform in support of the newly established gamelan set at AUT, lead by Ki Joko Susilo. We accompanied the incredibly slow and refined choreography of Ibu Martini Tri Murjoko for the dance Tari Kayungyun – a show stopper. I’m looking forward to speaking in a panel on Minangkabau music and dance from West Sumatra, Indonesia, with colleagues Dr Susas Rita Loravianti and Dr Nusyrwan. We will attend the Performing Arts of Southeast Asia (PASEA) conference in Sabah Museum, Kota Kinabulu, Malaysia. This is the first time that papers have been accepted in the ASEAN languages of the region. We will present our papers in a mix of Minangkabau, Indonesian and English. This multi-lingual conference is a welcome addition to the predominantly English-language conference circuit and opens networks for those whose first language is not English. See our articles in the PASEA 2018 proceedings. Dr Susas Rita Loravianti (left) at the coronation of Dr. Sutan Muhammad Farid Thaib as Rajo Alam Minangkabau Pagaruyung Darul Qoror at Pagaruyuang Palace in Batusangkar, West Sumatra Indonesia. September 2018. Two very informative days with Indonesian guests hosted by GNS Science and the New Zealand/Indonesian collaborative programme called StIRRRD (Strengthening Indonesian Resilience:Reducing Risk from Disasters. Day 1 was a tour of vulnerable Wellington sites, including the Blue Tsunami Lines in Island Bay. These show tsunami safe zones outside the expected inundation areas, in the event of a tsunami. Bapak Edi Hasymi, head of Padang Regional Disaster Management (BPBD), gave a presentation on the second day at Te Papa, explaining how these lines have been adopted in Padang on the West Coast of Sumatra. As the city is situated right near the beach, with hills at a distance, the disaster management teams have added progressive sign posts, showing how much further you need to run, while evacuating. We discussed my work regarding rabab Pasisia performers from Padang and the neighbouring Pesisir Selatan (South Coast) district who reference indigenous knowledge about local disaster risks, such as earthquakes and floods, in sung narratives called kaba and paruntuangan. Bapak Pirin Asmara, Bapak Siril Asmara, Bapak Iye and Bapak Eddie Asmara. At Cuab Dupa! Another amazing Javanese puppet show with our friend Ki Joko Susilo, who presented Gathutkaca Gugur (The Fall of Gathutkaca) in English and Javanese accompanied by Gamelan Padhang Moncar, in Wellington. Such an honour to perform music with him. Brief synopsis of the Mahabarata episode that we performed: As the war between the royal cousins Pandawa and Korawa rages on, Prince Abimanyo is killed. Furious, Gathutkaca heads into battle, bidding his pregnant wife Pergiwa farewell. Tragically, Gathutkaca is slain by the magic arrow called Wijayan Danu. With collaboration from Sumatran colleagues Dr Susas Rita Loravianti and Ibu Armida Kampai, I co-presented the first semi-virtual panel at the World Conference of The International Council for Traditional Music, 2017 in Limerick, Ireland (ICTM). Our paper “The Plane Truth: Academic Flying, Climate Change, and the Future of Music Research” addressed the issue of frequent air travel by academics for conferences, networking, fieldwork, and other academic activities. We urged academics to reflect on how often they fly and suggested ways to reduce flying. Coming from New Zealand that is a big deal! Dr Catherine Grant in Brisbane and myself in Wellington used goto meeting to talk to conference attendees, while Dr Aaron Pettigrew presented live and co-ordinated our video presentations. When academic societies include options for virtual presentations, two major issues are addressed. 1. We can all reduce carbon emissions from flying around the globe. 2. Virtual presentations mitigate the considerable costs associated with conference travel that are prohibitive for most academics in many countries around the world. See our article on the USA based Society for Ethnomusicology’s blog. The panel was featured on an episode of Culture File on RTE Irish National Radio. Funtimes! – hosting the Indonesian music and dance group Seni Nan Gombang from Painan, West Sumatra. They performed popular and traditional dance and music at the Southeast Asian Night Market on Wellington’s waterfront. They then travelled to Gisborne to share music and theatre performances, which contain indigenous knowledge about natural disasters, with iwi in Ngati Porou. A lot of love for a kiwi rabab Pasisia player as I gave a short impromptu performance of a kaba sung narrative opener and the 1980s pop hit ‘Genyang’, during a trip to Agam, West Sumatra. Journalist Maswir Chaniago’s facebook post went viral with 165,000 views and over 6,000 shares. My 6 part radio documentary How Hybrid, about popular culture and the globalisation of 5 instruments, was broadcast again on RadioNZ in their Summer Sonic programming. An important interview with Bryan Crump at RadioNZ about how indigenous knowledge that references natural disasters is archived in popular and traditional music in Indonesia. Just a week after our own devastating 7.8 Kaikoura earthquake, during which I was in Sumatra delivering a keynote on this very topic (see below). I was honoured to give a keynote address for the International Seminar at the 9th Indonesian Arts Festival for tertiary students, which saw the arts institute, Institute Seni Indonesia (ISI) host academics and students from Indonesia’s nine performing arts institutes. Keynote – “Mengingat Krakatau: Musik, Spiritualitas dan Bencana Alam di Indonesia” (Remembering Krakatau: Music, Spirituality and Natural Disasters in Indonesia). Interview at 01.53 about Gamelan Wellington that was featured on Indonesia’s primetime breakfast show Selamat Pagi Indonesia (good morning Indonesia). With Budi Putra at NZSM, Victoria University (see YouTube NZ Gamelan Metro TV). Indonesian English language daily profiles my work in Sumatra and NZ. “Sung narratives help reduce disaster risk” Nina Susilo – Kompas. Indonesian national daily newspaper Kompas reported on Selebrasi 20 Years of Gamelan at Otago University. An honour to travel to Dunedin and deliver the Keynote Address for Joko Susilo and his team. I talked about the prevalence of disaster warnings and messages in the story-lines of Sumatran music. See also Noel Trustram’s multi-media book project ‘Aceh Revives’ and the collaborative project between Gajah Mada University and GNS science, StiRRRD, on disaster risk reduction in Indonesia. APRA/AMCOS Silver Scrolls appearance. With Gareth Farr, Johnny Marks and Balinese Gong Kebyar style gamelan group Taniwha Jaya. 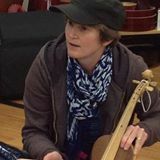 Megan played Sumatran rabab [fiddle] in the style of the late Pirin Asmara for Gareth’s arrangement of Tami Neilson’s song ‘Walk – back to your arms’. Later in the evening ‘Walk’ earned Tami the Silver Scroll (for top song of the year), which was presented to her by Lorde (Wellington 30 October 2014). Listen to our rehearsal process with Johnny earlier in the week, with the team from Radio NZ’s ‘Music 101’. Winter Wayang Shadow Puppet Show (Wellington June 2014). ‘Tinggal’ [Stay] written for Bali gamelan on Naga – New Music for Gamelan, from Rattle (March 2014). Java gamelan sound effects for the film ‘The Hobbit: The Desolation of Smaug’. Watch our rehearsals, lead by Budi Putra at Victoria University, in Peter Jackson’s production diary #14 from 07.00 (Aug 2013). Sumatran rabab in raun sabilik popular music on the south coast, West Sumatra, Ind. (May/June 2013). Sumatran Tiger Puppets at WOMAD Taranaki NZ (March 2012) with Ki Joko Susilo, 8th generation Indonesian shadow puppet master.